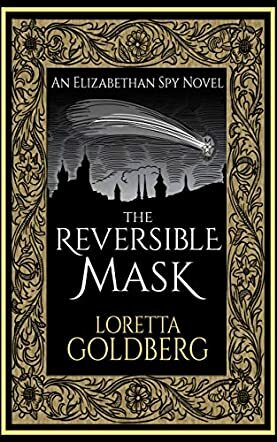 The Reversible Mask: An Elizabethan Spy Novel by Loretta Goldberg centers on an historical event and brings to life strong personages. It is the summer of 1566 and Oxford is experiencing growth in many aspects of life — art, science, politics. While everyone is celebrating the royal progress, Sir Edward Latham doesn’t celebrate. At the opening of the story, he observes from afar, savoring the contradiction that he could have been in the heart of the procession. Abandoning his title and country, Edward Latham travels abroad to serve the Catholic monarchs, but his soul is troubled all the while and when his homeland is threatened by religious wars, he offers to become a double agent for Queen Elizabeth. Loretta Goldberg brings to life the Golden Age in England and navigates some key historical happenings with readers, plunging them into a rich culture and a conflict that threatened history at the time. The protagonist is deftly developed, a man torn between his personal values and beliefs and the love of his country. I loved the writing and the images it evokes. The colorful descriptions at the opening allow readers to savor a moment of jubilation while getting acquainted with a sophisticated character, a royal character, and the conflict. But what caught my attention even more is how the author allows the manner of speech at the time to flavor the exciting dialogues, showcasing the culture beautifully and portraying elements of the setting in the narrative. The Reversible Mask: An Elizabethan Spy Novel is cunningly plotted with a conflict that is skillfully developed. The narrative voice is strong and smooth and it has a grip on the reader right away. I loved this novel and the deft handling of characters, but it is the complex nature of the conflict that makes it even more engrossing.